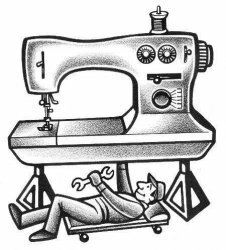 Most consumer sewing machines and sergers can be serviced and repaired by the staff at Keeping You Sewing. Old or new, simple or complex, Keeping You Sewing will make sure you can get back to your sewing projects. As one of only 15 Husqvarna Viking Blue/Gold Certified Service Technicians in the United States, Kim and the staff will provide the best possible service for your machine. All sewing machines and sergers should be serviced at least once a year, more often if you sew a lot. Machines can be dropped off at your convenience. Please bring the foot control and electrical cord for your machine as well as the bobbin and bobbin case. A zigzag presser foot would be helpful.